Happy Earth Day! Time to get outside and take a walk! Hubby and I have a lot of options for our walks. This fire road trail is close to our place and we do not have to drive anywhere. It is a 2 mile round trip walk from our house. We have views of the lake and some tall pine trees. We pass by the opposite side of the Great Blue Heron's nest, the same nest I see from our house and yard. We saw a flock of Purple Finches during our walk, they have a sweet sound. 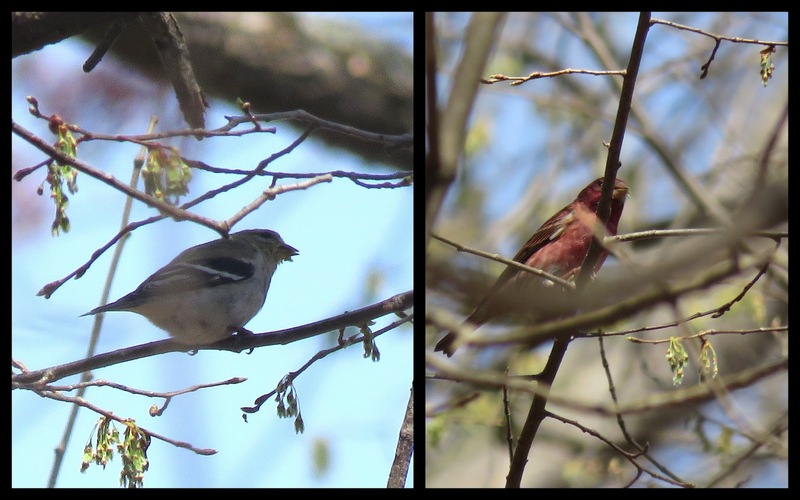 The Purple Finches stayed high in the tree, it was hard trying to get a good photo with branches in the way. A flock of mixed finches were in the trees above the fire road, this was a Goldfinch. 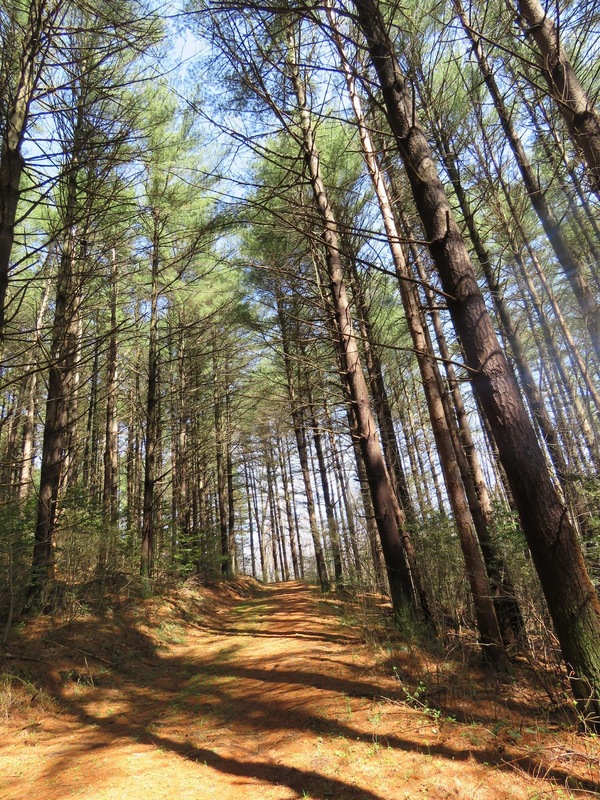 I love these pine trees. There is NO Planet B. Take care of our Earth! 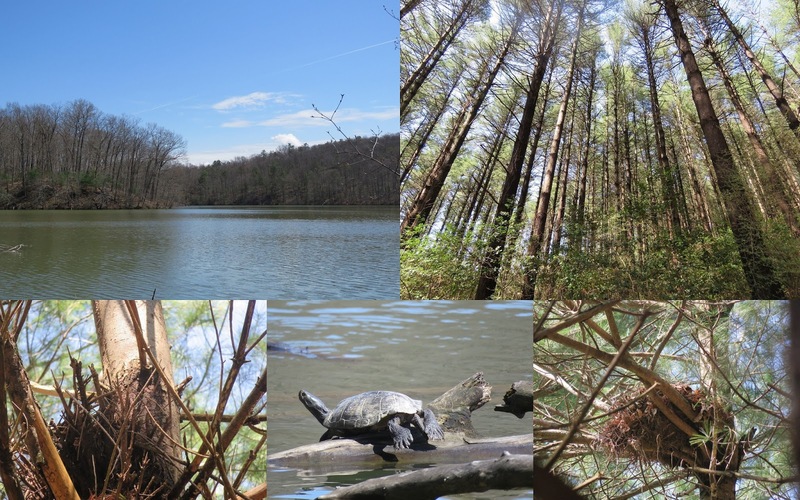 A view of the lake, pine trees along the fire road, a few nest high in the trees and a Turtle. Recently blogger John from John's island asked me if our lake had a name. 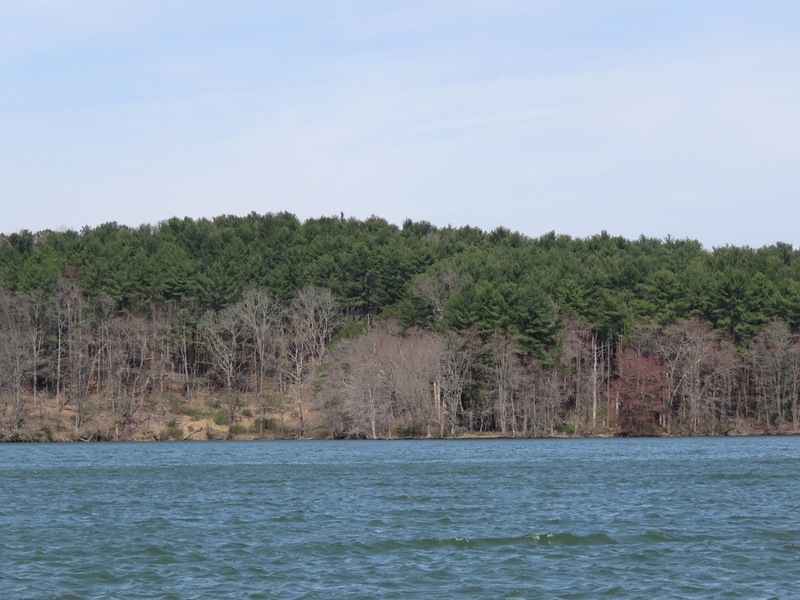 The name of our lake/reservoir is Prettyboy, it is one of 3 reservoirs that hold drinking water for Baltimore City. We are at the top part of the lake and there is a dam at the lower section. I have blogged many times about our walks around our Prettyboy lake and at the dam. A view of the lake, there is a turtle on a log and a fisherman nearby. 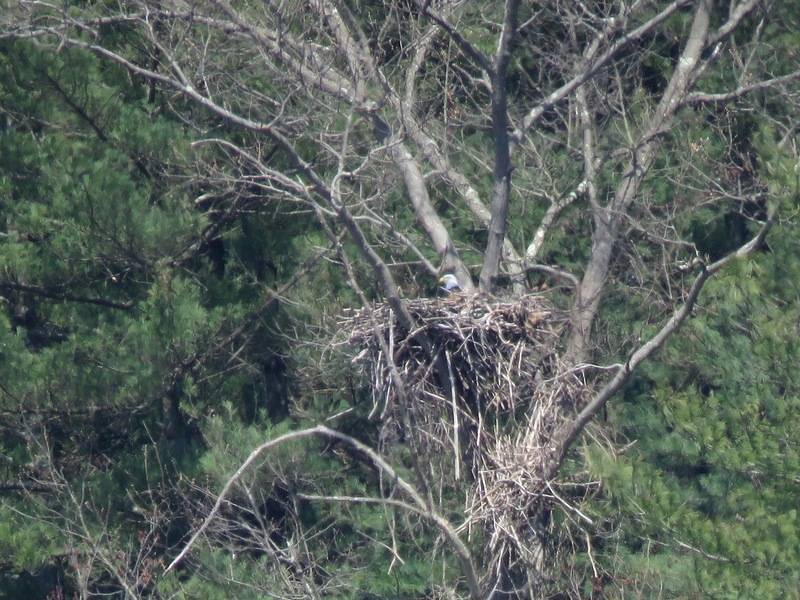 We have another view of these Heron's nest from our house but this view was from the nearby fire road. There are two nest below one nest looks very small is is still being worked on and then there is one right below which is more substantial in size. This nest is in a bare tree, I worried when I could see the nest and tree swaying back and forth on a windy day. Check out the links above, I hope to see you there. Thanks to the hosts today. Enjoy your day and new week. 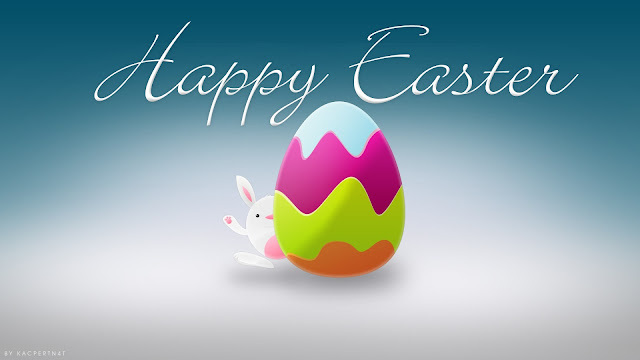 Comments off, enjoy your day! Except for local walks on the fire roads and my backyard I have not been anywhere to see critters. So I am sharing some of my back yard birds and some herons from the nearby nest and a new born foal in the neighborhood. The Dark-eyed Juncos are still here, they are a winter visitor for my area. The Chipping Sparrow is a Spring/Summer bird for my area. A neighborhood farm has a few horses and this momma has a new foal. Very cute! A Great Blue Heron on a nest, I can see this nest from our kitchen window. These two herons were having an argument, I can watch them from our house and deck. When the leaves are back on the trees my views of the herons nest will be gone. The heron flying away lost the argument. The Easter Bunny came to visit my yard. Hubby and I enjoyed some of our nice weather lately by going on a walk to see the Bald Eagle nest at our lake. We had a pretty sky day, mostly blue sky, some clouds here and there. We were able to see the white head of the adult eagle on the nest. Not sure if the eggs have hatched yet. We could hear some Canada Geese in the distance and was able to find a Belted Kingfisher flying back and forth along the lake's edge. The kingfisher was across the lake, too far for a clear photo. I still like to document my sightings, this was my first sighting of the kingfisher this season. 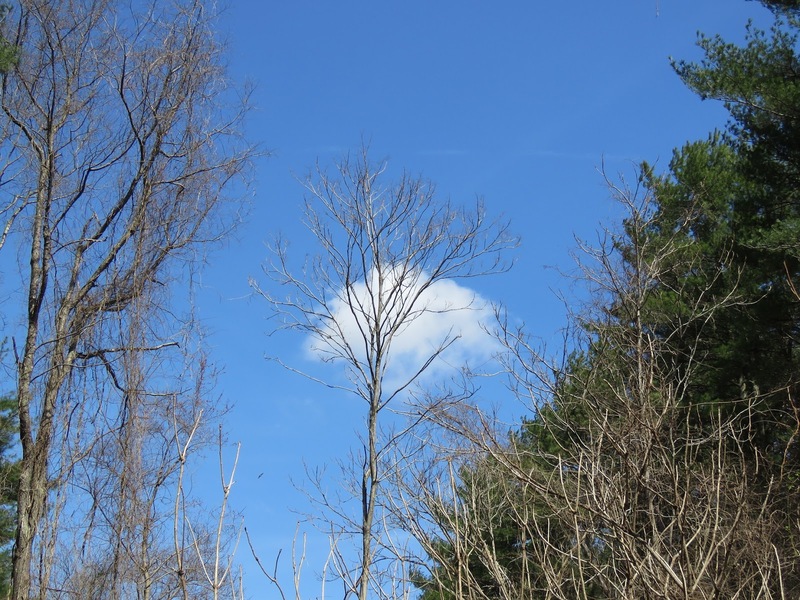 The budding trees remind me of fall with the pretty red colored buds. I am thankful the for good spring weather and a nice walk. Spring has sprung in my neighborhood and yard. 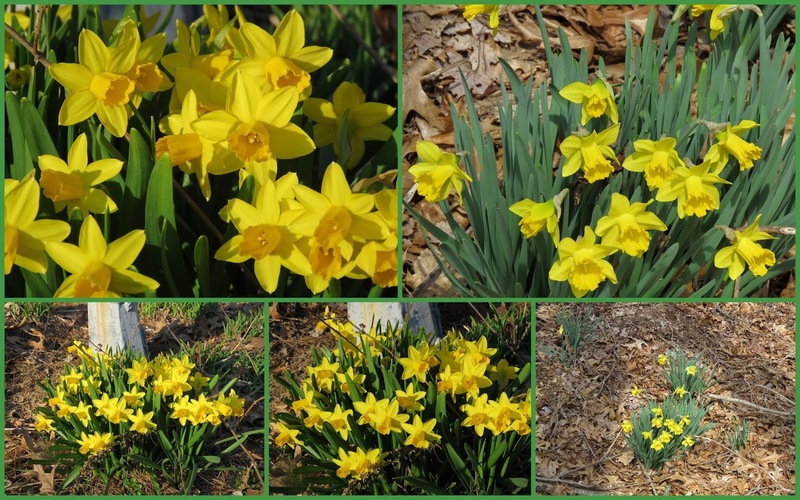 Our first blooms to see are the daffodils. We are seeing lots of new buds on the trees and our forsythia is about to bloom. 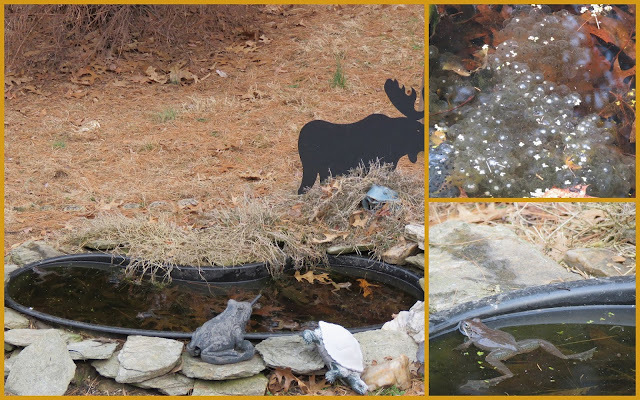 I was thankful for my hubby doing some spring cleaning in the yard and pond. The frogs will be happy that the leaves were removed. Living next to the forest, we have way too many leaves in our yard. I saw about 5-6 frogs in our little pond. One day I saw the frog eggs floating on top of the pond. 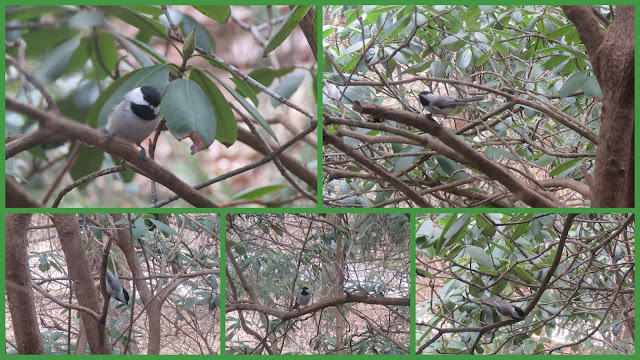 The Carolina Chickadee has a nest in our side yard, they were fussing at me one day when I walked past to get our mail. The Great Blue Herons are adding to their nest, I guess to make it sturdier!